Coach Sonny Dykes and the Cal staff are not taking PSU lightly: the Golden Bears are a very young team, and they need as much live game action as possible. Coach Dykes also subscribes to the “one game at a time” mantra, and thus there’s no looking ahead to next week’s matchup versus Ohio State. Nevertheless, Cal is a heavy favorite, and it would be a shock if the game isn’t firmly in Cal’s favor by halftime. After a long offseason and a spirited fall camp (HT Nam@CGB), football returns to California Memorial Stadium this Saturday, August 31. 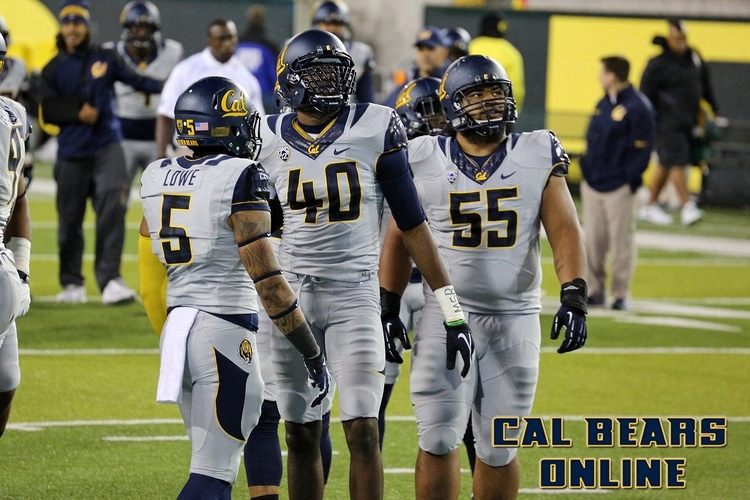 The season opener features the debut of new Cal Coach Sonny Dykes and the high-tempo Bear Raid. The sturdy Golden Bears – who may have the toughest schedule in the country – match up against the 22nd [in both the AP & USA Today polls] ranked Northwestern Wildcats. Cal starts true freshman QB Jared Goff, while Northwestern will have the dual-QB tandem of Kain Colter and Trevor Siemian. We should expect a fairly high scoring affair, as both teams will showcase explosive playmakers on offense – including RB Brendan Bigelow (Cal) and RB/KR Venric Mark (Northwestern). 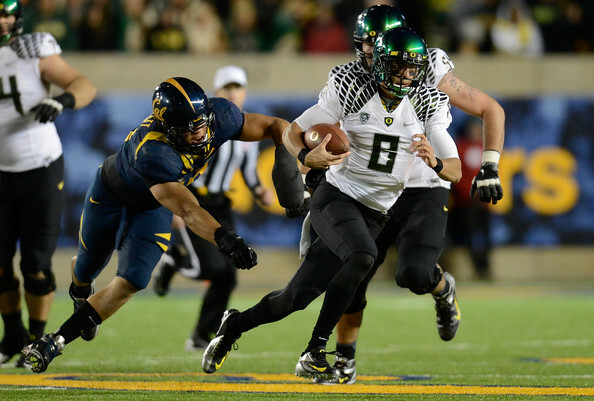 With kickoff set for 7:30pm Pacific, everyone should look forward to an exciting night game! Cal is not only breaking in two new schemes on offense and defense, both of which are significantly different than what the Bears ran a year ago, it will also start 10 sophomores or freshmen. While the talent is promising, this is a young team that could experience some growing pains on Saturday. True freshman signal caller Jared Goff will direct the Bear Raid, but Cal will be missing veteran LB Nick Forbes, who is doubtful to play due to a lingering back injury. RS freshman LB Hardy Nickerson will start in his place. Leading returning WR Chris Harper, who had hurt his shoulder earlier in the week, will also start – as will SS Avery Sebastian, who had suffered a scary concussion a week into fall camp. DE Brennan Scarlett will dress, but is questionable as he was limited all camp – as a result of a slow recovery from a broken hand that he suffered last season. Cal’s offense will feature multiple running backs out of various sets – including the “regular” spread look, as well as the diamond & pistol formations. 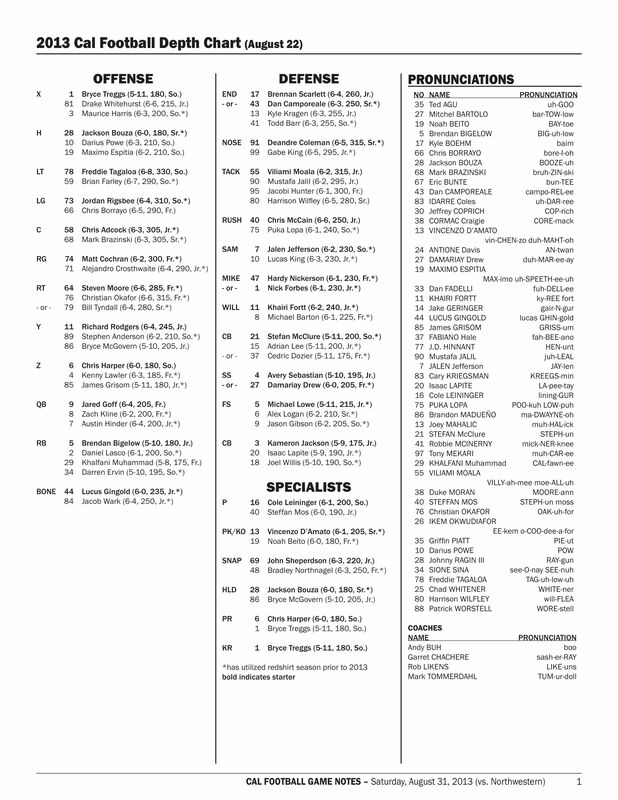 Brendan Bigelow will start, but Daniel Lasco and Khalfani Muhammad are expected to receive a decent number of snaps. Offensive Coordinator Tony Franklin has been on record stating that at least 10 receivers (outside & inside) will play during a given game. This means that in addition to starters Chris Harper & Bryce Treggs (Z & X – outside) and Richard Rodgers & Jackson Bouza (Y & H – inside), reserves such as Kenny Lawler & Maurice Harris (outside) and Maximo Espitia & Darius Powe (inside) will receive significant playing time. The offensive line is led by returning starter C Chris Adcock, who is responsible for the cadence (snap count) and line calls (protections) in the Dykes/Franklin system. Freddie Tagaloa & Jordan Rigsbee anchor the left side of the line, while rookies Matt Cochran & Steve Moore – both redshirt freshmen, and thus a potential weak point up front – are slated to hold down the right side. Look for senior Bill Tyndall and walk-on Brian Farley to come in as the first subs off the bench. Defensive Coordinator Andy Buh runs a base 4-3, and we should expect to see heavy rotation in the front-7 to keep the D fresh – especially if the Bear Raid runs at the 8-second-between-plays tempo that is Franklin’s reported goal. Deandre Coleman & Vei Moala will start at DT, but Mustafa Jalil & Gabe King should get plenty of snaps. Similarly, Chris McCain & Dan Camporeale will start at DE, but Kyle Kragen & Todd Barr should play as well. Puka Lopa & Brennan Scarlett may even get into the rotation at some point. Jalen Jefferson & Khairi Fortt will be the “everydown” LB’s in the 4-2-5 set – which we should see often as a counter to Northwestern multiple/spread-option attack. Hardy Nickerson will be the MLB in the base defense, while fellow RS freshman Mike Barton should rotate in when Jefferson or Fortt need a breather. The secondary is the most vulnerable part of the Cal defense. Beyond starters Stefan McClure & Kam Jackson (at CB) and Avery Sebastian & Mike Lowe (at SS/FS), there is very little depth. Buh will need youngsters such as S Damariay Drew & NB Issac Lapite to play well in nickel and dime packages. Former WR Joel Willis, who converted to DB in the last week of camp, may get playing time in nickel/dime looks as well.